This painting is one of my very favorite works of the great Spanish court painter Diego Rodriguez de Silva y Velazquez. It’s a loving depiction of Infante Felipe (Philip) Prospero around 1660. (Infante and Infanta were the titles of boy and girl royal children, respectively). Felipe Prospero was born in 1657. He was a long-awaited heir to the Spanish throne. His father was Philip IV of Spain; his mother was Philip’s second wife, Mariana of Austria. A son was essential; otherwise the husbands of Philip’s daughters would fight over the throne when he was gone. The previous male heir, Prince Balthasar Charles, had died as a teenager, eleven years earlier. His death dashed the hopes of Philip IV for a stirring military career for his son. As a devout Catholic, Philip believed that his sins had somehow caused the death of Balthasar. (Actually, the cause was most likely the collective sins of his family, who for many generations intermarried with their Habsburg cousins in order to keep their hold on power). Felipe Prospero was greeted with ecstatic celebrations and baptized at the earliest possible moment, to the great joy of his parents and their subjects. Water was brought from the River Jordan for the baptism. The Spanish people celebrated with masquerades, bullfights, processions and also getting drunk and breaking up furniture. 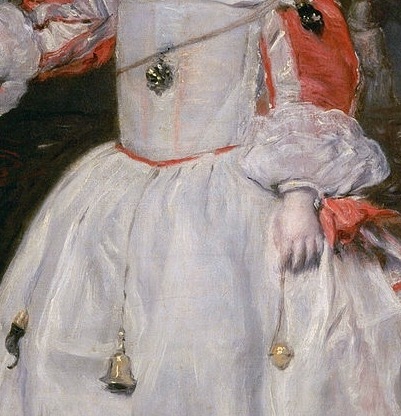 But the child was sickly, a fact that Velazquez did not try to hide. Felipe Prospero is pale. His eyes have a hollow look. Years of inbreeding between the Spanish and Austrian royal families had left him with a damaged immune system. The amulets tied around his waist and across his chest were meant to ward off disease. Nothing could help his worst medical problem, though. Inbreeding had left Felipe severely epileptic. 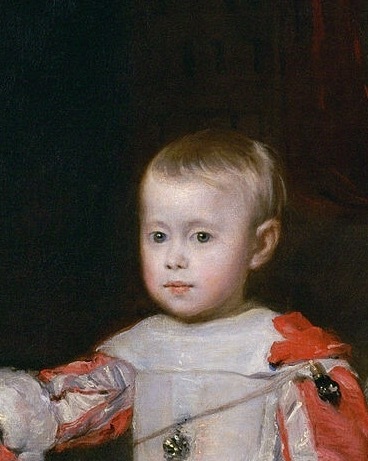 The child lived for only a short time after Velazquez painted this portrait. He died of a violent epileptic seizure in 1661, at age 3. The painting captures the little boy’s wistful beauty, his fragility, and the sadness that surrounded him. His little dog seems already to be mourning the child’s early death. 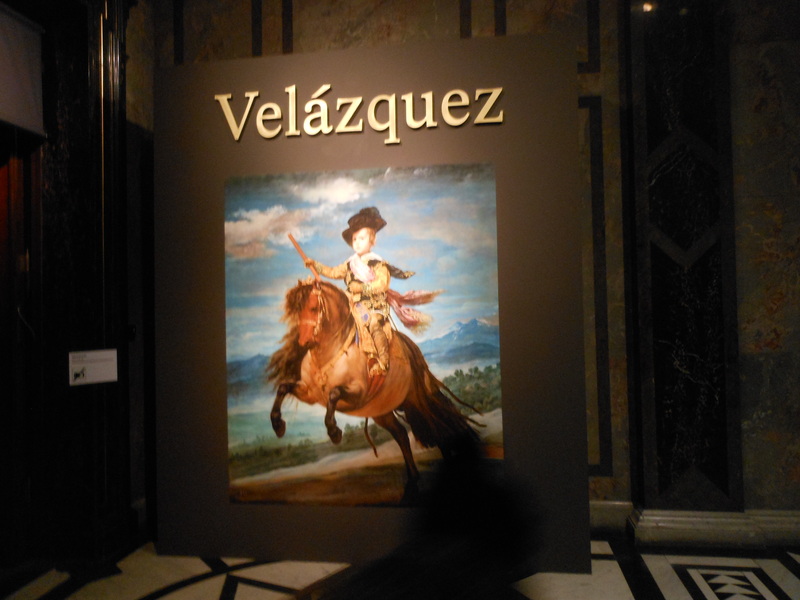 Velazquez was honored with a special exhibition last winter in Vienna. The museum already has the largest collection of Velazquez paintings outside of Spain, and more were brought in for the spectacular exhibition. 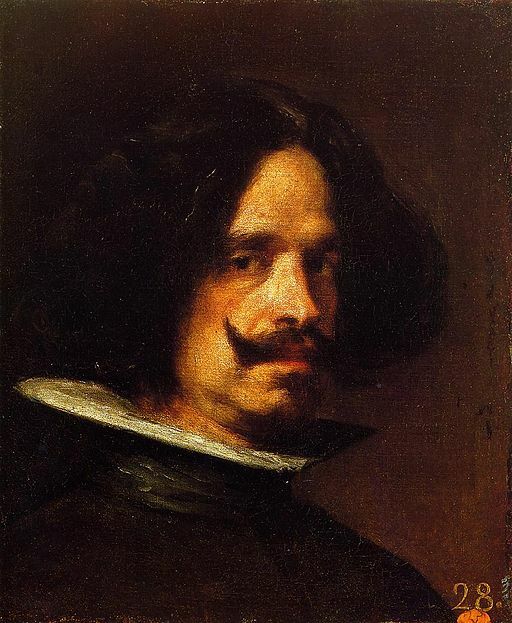 Because the Habsburgs enthusiastically intermarried with their Spanish cousins, Velazquez was kept busy painting portraits of prospective brides and grooms at various ages. The portraits are enchanting–and haunting. 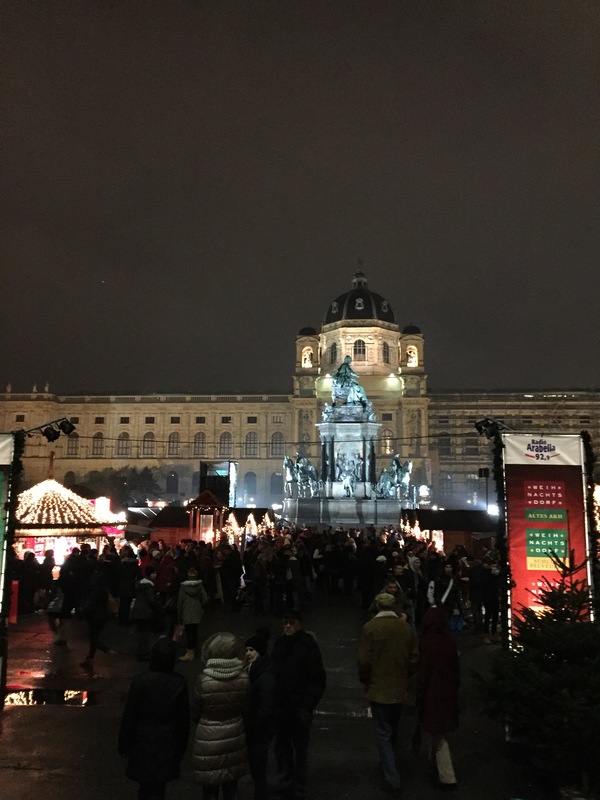 This entry was posted in Art, Artists, Austria, Vienna, Vienna Kunsthistorisches Museum and tagged Diego Velazquez, Habsburg intermarriages, Infante Felipe Prospero, King Philip IV of Spain, Mariana of Austria, Vienna Kunsthistorisches Museum on July 28, 2015 by Claudia Suzan Carley. Last winter the Vienna Kunsthistorisches Museum had a wonderful exhibit of paintings by the Spanish master, Diego Velazquez. Many of them were from the museum’s stellar collection by the artist, but some, like the portrait used for the banners, were borrowed. The December week I spent in Vienna it rained all day, every day. Sometimes, it is true, the rain was only a gentle mist. But I never saw a single moment without some kind of wetness falling from the gray sky. Snow in Vienna is beautiful and romantic. Rain? Not so much. 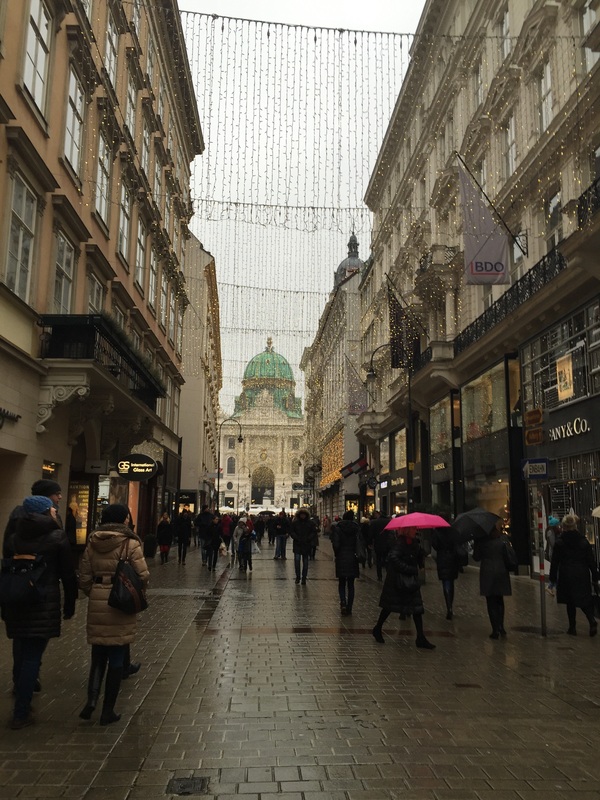 Still, there is more than enough to do indoors in culture-rich Vienna. I always say that I don’t travel to Europe for the weather. Diego Velazquez, considered by many to be the greatest of all European painters, was an honored guest at the Kunsthistorisches Museum. I had a yearly museum pass, so I ducked into the Kunst almost every day. I was often dripping wet, but each time I stashed my raincoat and revisited the Velazquez exhibit, I forgot all about being chilled and damp. I felt as though I had been to sunny Spain for awhile. The museum owns a number of the works of Velazquez, because of the close family ties (inbreeding, actually) between the Habsburgs and Spanish royalty. The young boy in the portrait below was (literally) the poster child for the exhibit. Who was this boy? 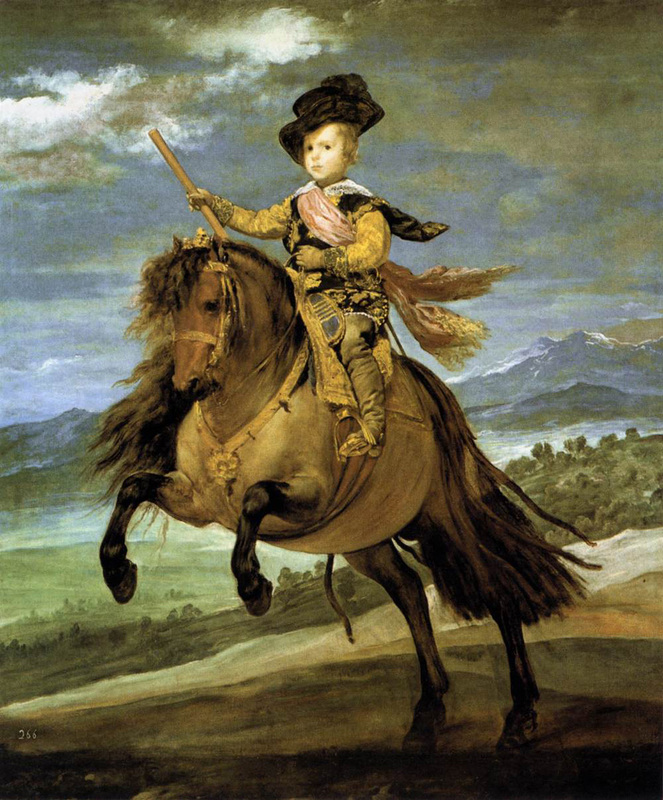 The child posed confidently on a galloping horse was Prince Balthasar Charles, Prince of Asturias. He was the long-awaited male heir to the Spanish throne, the only son of King Philip IV and his first wife, Elisabeth of Spain. The Prince was born to great fanfare in 1629. The boy appears to be at most eight or ten years old in his portrait, but that didn’t stop his parents from having him painted brandishing the baton of a Field Marshal. He was born to lead, educated to lead, and expected to lead. King Philip IV faced challenges to the continuing rule of his family. He needed this heir desperately. The hopes of his family and his country rested on this little boy’s shoulders. Sadly, Prince Balthasar Charles died at the age of 17 from smallpox. Monarchies all over Europe awarded batons to important military officers, royal or merely aristocratic. I imagine a Marshal wielding his baton the way Moses wielded the rod he used to lead the people of Israel. Possibly the Biblical story is even one of the origins of the marshal’s baton. In most European armies, Field Marshal was the highest military rank, above even a General. Usually it was awarded only to a person who was already a General, and only after extraordinary achievement, like winning an important battle. 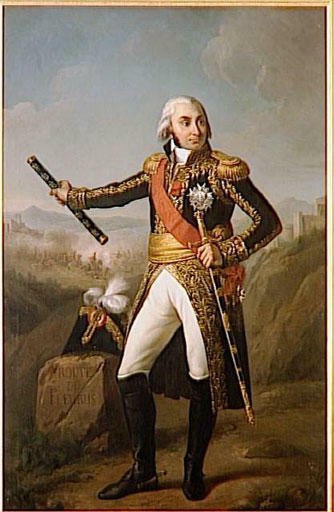 But the marshal’s baton in this portrait was purely wishful thinking. Prince Balthasar Charles never had his chance at glory on the battlefield. His family waited eleven long years for another male heir. 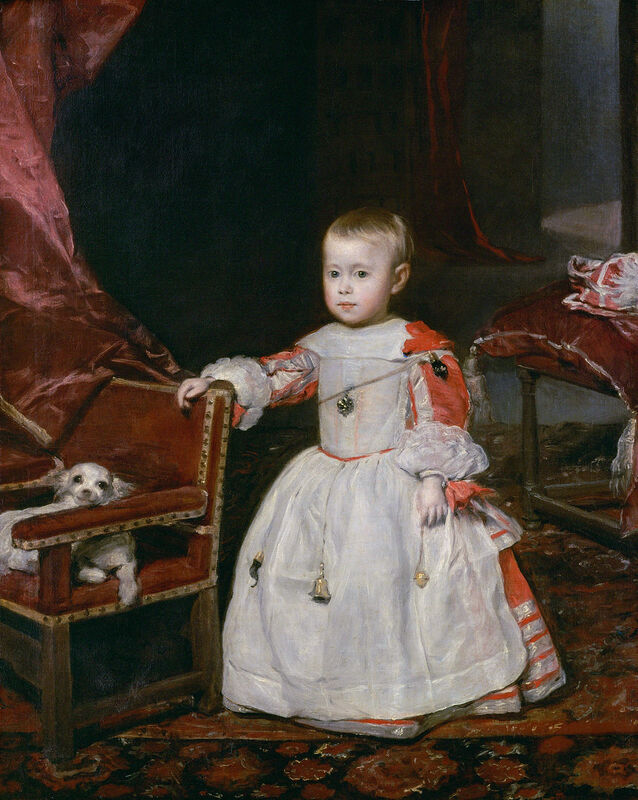 My next post will tell the story of that Spanish royal child, subject of one of my very favorite Velazquez masterpieces. This entry was posted in Art, Austria, Historical Figures, History, Spain, Vienna, Vienna Kunsthistorisches Museum and tagged "Jean-Baptiste, compte Jourdan, Diego Velazquez, Eugene Charpentier, King Philip IV of Spain, marechal de France", marshal's baton, Prince Balthasar Charles of Spain, Prince of Asturias, Queen Elisabeth of Spain, Vienna Kunsthistorisches Museum on July 27, 2015 by Claudia Suzan Carley. Animal lover that I am, one of my favorite saints is Jerome, AKA Saint Hieronymous. Why? Because he befriended a lion in the wilderness–or at least so the legend goes. 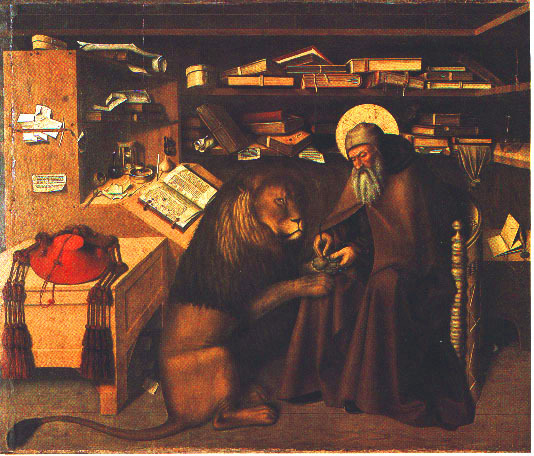 In the painting above, the lion has ventured into the saint’s dusty study with a thorn in his paw. Jerome sets his book aside and carefully removes the thorn. 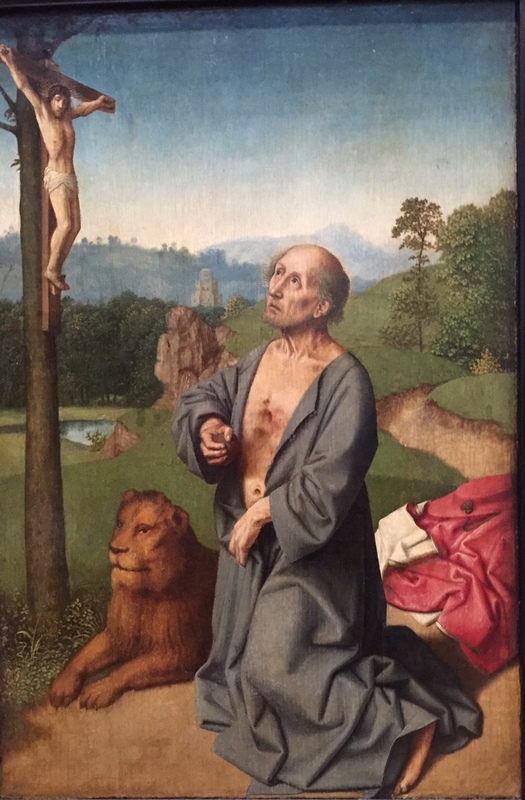 In other depictions, the saint comes across the lion, writhing in pain, out in the wilds. Either way, the legend is that from the moment Jerome extracted the thorn, the lion never left his side. Jerome was born around the year 347 A.D. He lived mostly in what is now Croatia. A scholarly fellow, he became one of the earliest Doctors of the Church, before titles like “Cardinal” existed. One of his main accomplishments was translating the Bible into Latin, from its original Aramaic and Greek. 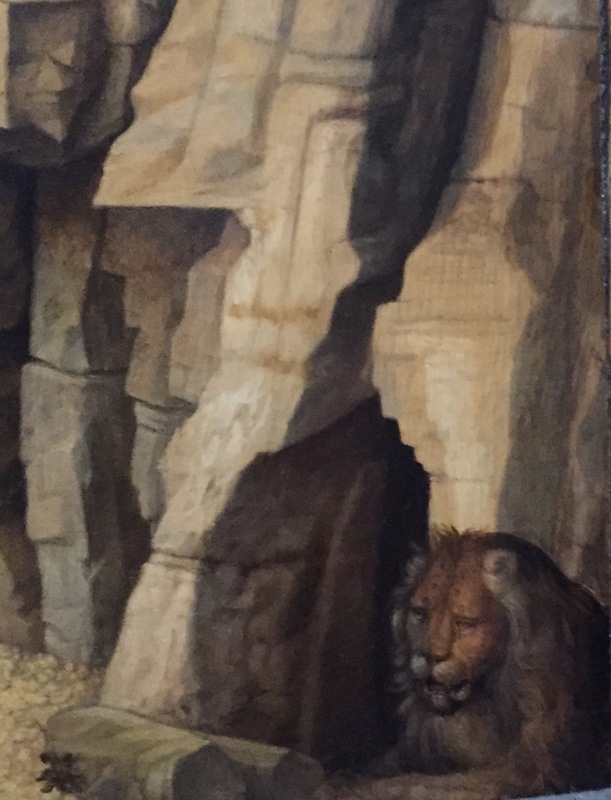 In paintings, the lion often lurks under a table or in a dark corner. I took the two photos above in the Kunsthistorisches Museum in Vienna. 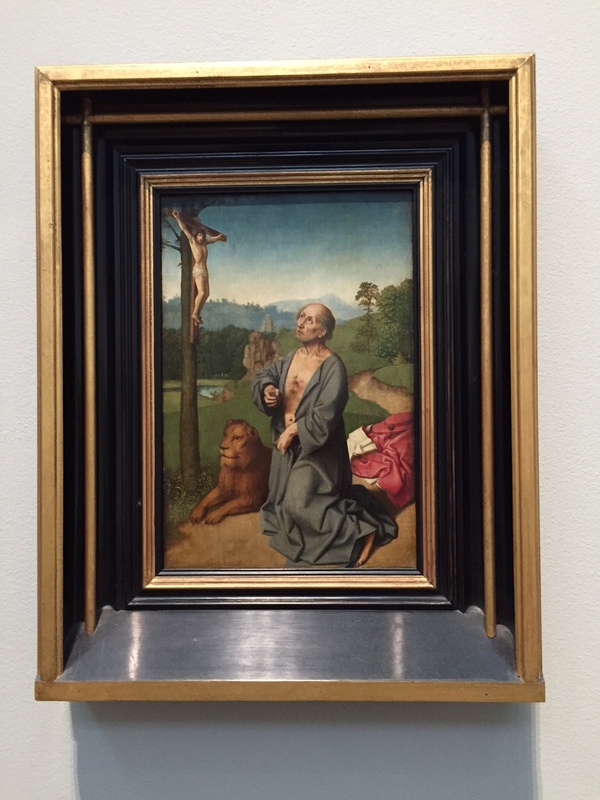 I love the legend, and whenever I’m in an art museum I’m on the lookout for images of Jerome and his lion. They have been painted countless times. Whenever I spot Jerome and his lion, I move in for a closeup. To me, Jerome’s friendship with his lion is part of his concern and care for the whole creation. Sometimes the lion is not underfoot, but he’s always close by. He’s a little hard to spot in the painting above. Time to move in for a closer look. The faithful lion is always present. 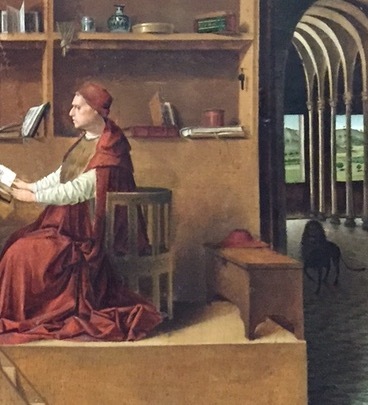 In the painting of Jerome in the large study above, he’s patrolling the perimeter. No matter what, the lion always had Jerome’s back. If the lion’s face is shown, he always has a friendly, grateful, loyal face–much like a shy family dog. He tends to look a little wary–who is about to disturb his friend Jerome? 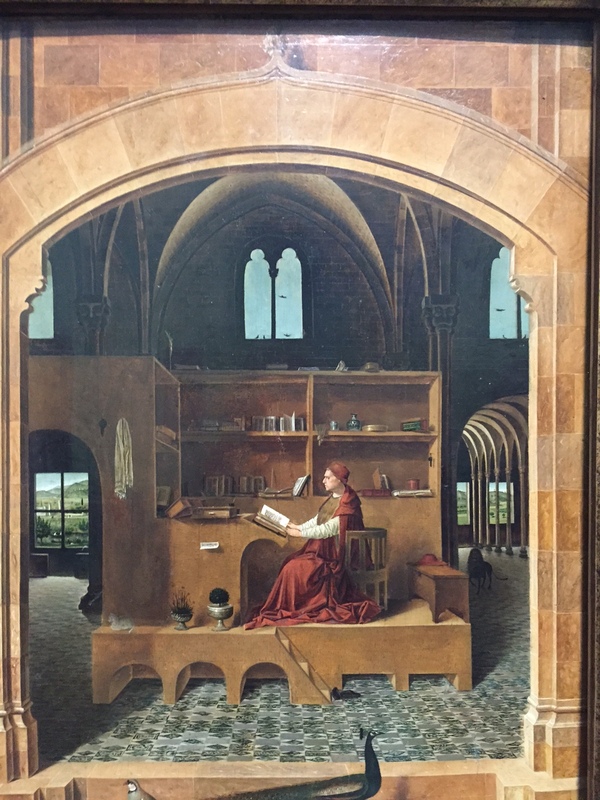 Are these paintings just sentimental portrayals of a serious saint who should be remembered for much more than a story that may not have happened at all? 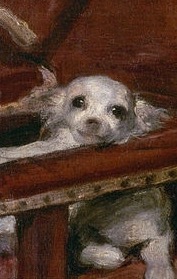 The subject is the medieval and Renaissance equivalent of sharing cute animal videos online. On a busy day, a couple of minutes spent watching photogenic animals feels to me like a guilty pleasure. What am I accomplishing by watching a gorilla rock a kitten to sleep or a dog rescue a teacup pig from drowning? Well, I’m not getting a thing done, but I’m pausing in a busy day to learn compassion from animals. 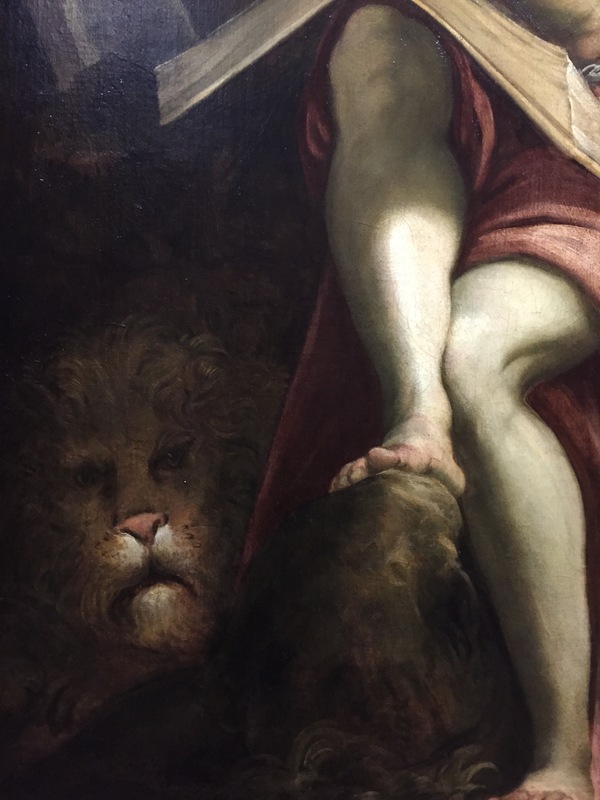 Like those videos, the images of St. Jerome and his lion give us an appreciation of our bond with the animals who share our world. The animals mostly treat each other and our world better than we humans do. 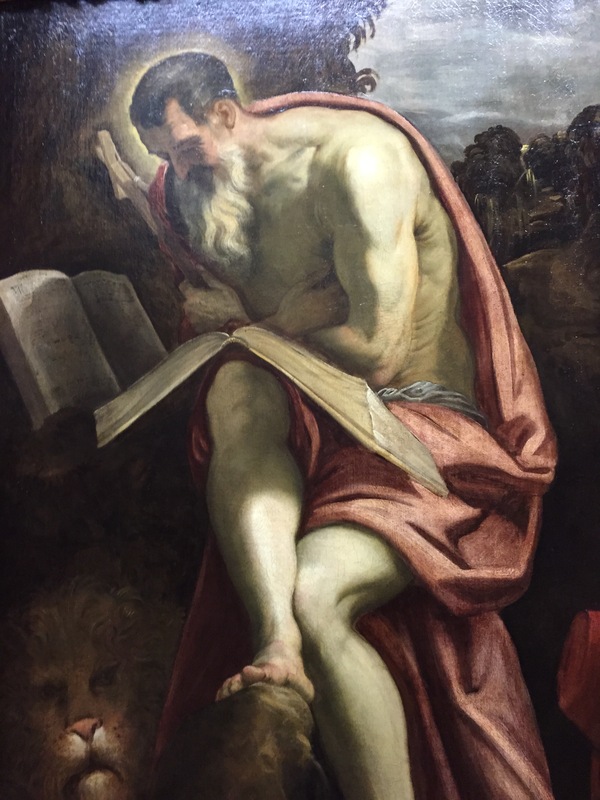 If I were St. Jerome, I wouldn’t mind being remembered as an animal lover as well as a high-powered scholar. 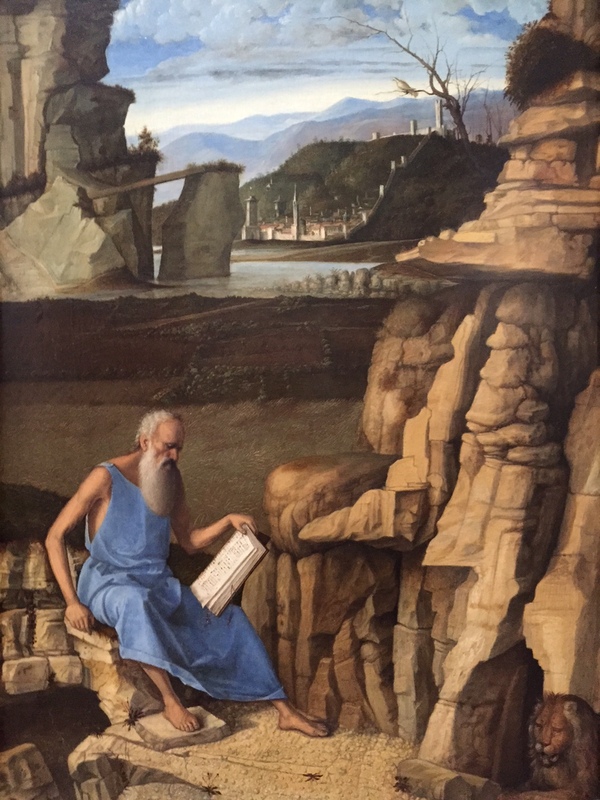 This entry was posted in Art, Artists, Austria, Vienna Kunsthistorisches Museum and tagged Antonello da Messina, Giovanni Bellini, Jacopo Tintoretto, Jerome in His Study, London, National Gallery, Niccolo Antonio Colantonio, Saint Jerome in a Landscape, Saint Jerome Reading in a Landscape, St. Hieronymous, St. Jerome and the Lion, St.Jerome, Vienna Kunsthistorisches Museum, Workshop of David Gerard on April 10, 2015 by Claudia Suzan Carley. 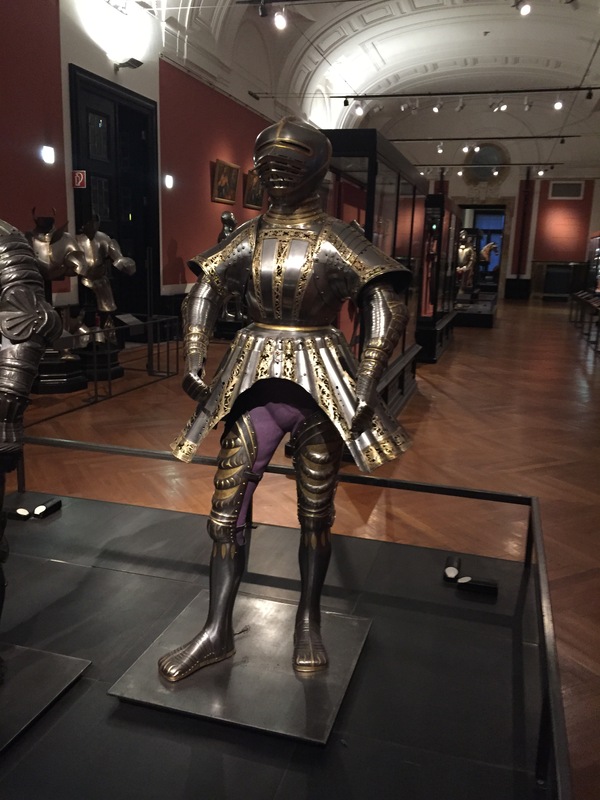 A couple of months ago in Vienna, I wandered into the Arms and Armour section of the Kunsthistorisches Museums–included with my museum pass, but not something that usually interests me much. But whoa! 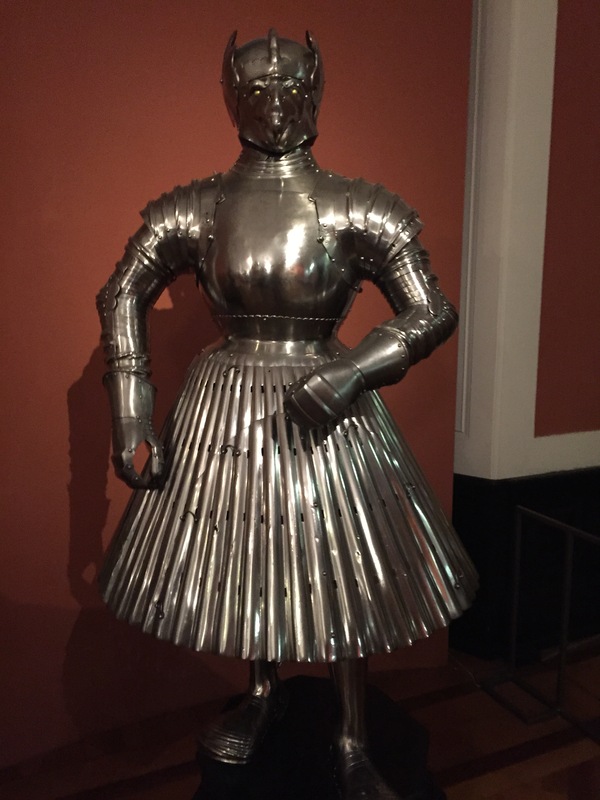 What was up with this extremely scary suit of armor with a skirt? Were there actual women requiring feminine suits of armor? The waist seems small enough for a woman. The helmet has a devilish look, male or female. Was this suit designed to get the enemy wondering exactly what he was up against? 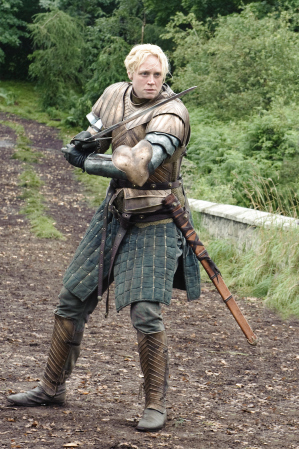 The series Game of Thrones features a fearsome female knight, Brienne of Tarth. Would she have worn something like this? On the show, she wears some skirt-like pads for swordfighting, but nothing like the getup above. I had trouble deciphering the German museum caption, and the photo I took of the caption didn’t turn out. The next day, I thought I’d pop back into the museum to investigate further. But the museum was closed. So I posted my mystery photo to one of the history Facebook groups I follow. Within minutes, people with a lot more knowledge than I had answers. Armor like this dates from about the 1500s. King Henry VIII of England had a set like it. It was not made for a woman, but for a man planning to engage in ground combat. The skirt would protect his legs better than traditional pants-style armor. Form-fitting armor needs joints that bend. Joints mean there are gaps that a sword or axe or spear could penetrate. A strong skirt, covering the knees, might look unwieldy to us, but we might be glad enough to reach for one if we were faced with hand-to-hand combat. The fluted design of the skirt was not just a fashion statement. The folds made the armor plate stronger. But it was still not strong enough to block musket fire, which was slowly taking over the battlefield. Fancy suits of armor went out of vogue on the battlefield by the 1700s, although kings and princes sometimes wore them into battle as marks of status, much as they sometimes wore battlefield crowns. This seems ill-advised to me–why make oneself an obvious target? Still, there are examples of elaborately decorated skirted suits designed to be worn on horseback. Anyway, skirted suits eventually became obsolete on the battlefield, but the nobility still wore them for jousting–an extreme sport for the rich in the Renaissance. Hans Holbein the Younger, among other highly paid artists, designed armor for noblemen to show off in. Later in Vienna, I came upon this store window, in a lingerie shop. Window display is an art. I have to think the display designer, like many Viennese, was a regular visitor to the Kunsthistorisches. This entry was posted in Austria, History, Vienna Kunsthistorisches Museum, Vienna Museums and tagged "Game of Thrones, Arms and Armour Museum Vienna, Brienne of Tarth, Hans Holbein the Younger, King Henry VIII, Skirted armor, Vienna Kunsthistorisches Museum on January 31, 2015 by Claudia Suzan Carley. 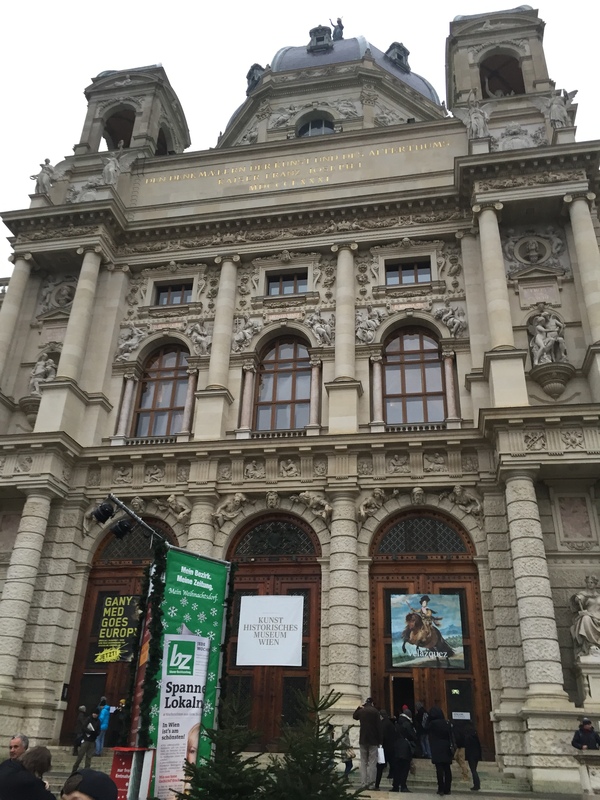 With great fanfare, the Vienna Kunsthistorisches Museum, or Museum of Fine Arts, opened a new wing a year ago: the Kunstkammer. Its twenty grand galleries contain many of the curiosities and playthings the Habsburgs collected during the six centuries they ruled a vast empire. Among the treasures displayed, a graceful figure about a foot high appealed to me. 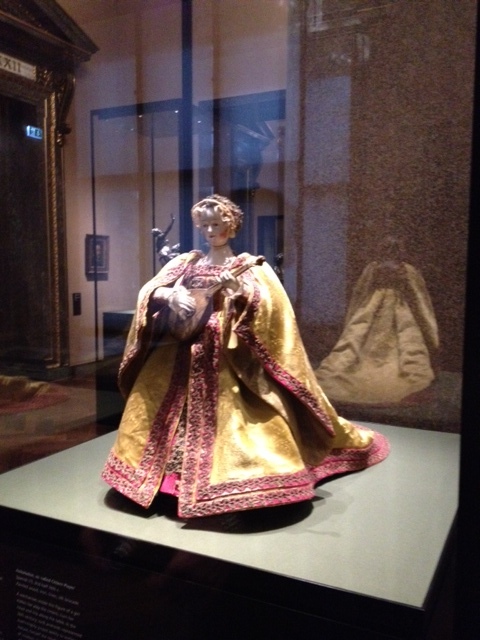 She was crafted of wood, iron, linen and silk brocade in the mid-1500s. She’s an android from the past, designed to astonish banquet guests by moving down the center of the table, turning her head and playing the musical instrument she holds. It’s called a cittern. The lady contains a music box which makes it appear that she is playing the stringed instrument. She was made by a famous Spanish clockmaker, Juanelo Toriano, who worked for Emperor Charles V.
Her caption explains that aside from simple entertainment value, such figures were highly prized because they demonstrated the human ability to imitate Nature, and thus to participate to some degree in the divine act of creation. I have to wonder if the men who dreamed up this particular figure would like to have controlled their real-life women as well as they could control this sweet-faced little lady. Be that as it may, her charming but enigmatic smile is a window into the past. 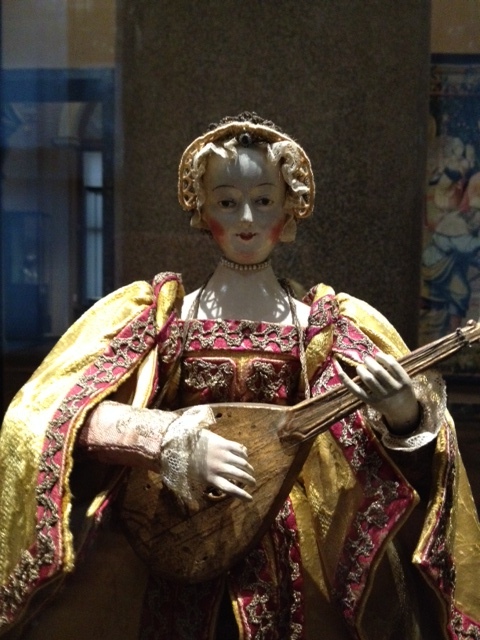 This entry was posted in Austria, Vienna and tagged cittern, Emperor Charles V, Juanelo Torriano, Kunstkammer, Vienna Kunsthistorisches Museum on March 15, 2014 by Claudia Suzan Carley. 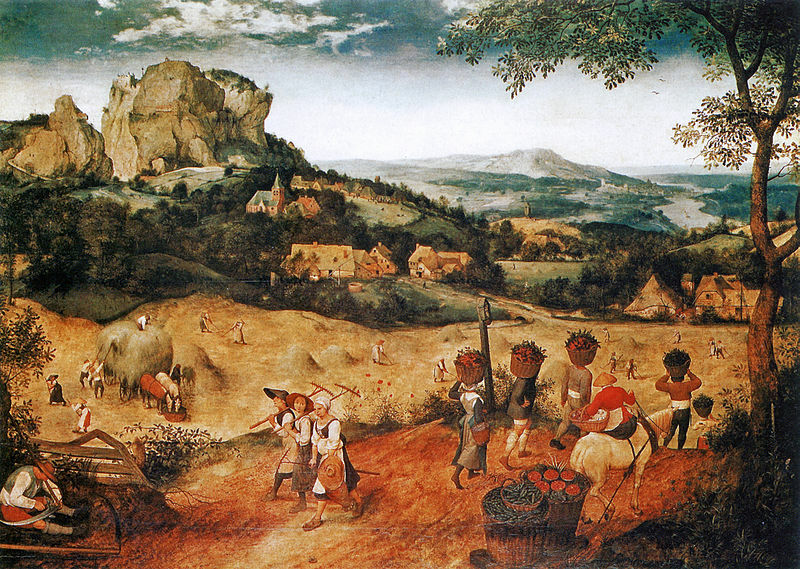 Pieter Breugel the Elder painted a series of six seasonal landscapes in around 1565. Each represents two months of the year. Five of them survive, including the beautiful and haunting “Hunters in the Snow,” now exhibited in the Vienna Kunsthistorisches Museum. The Lobkowicz Palace in Prague has the June and July panel, titled “Haymaking” or “The Haymakers.” It is as warm and inviting as the winter landscape is cool and mysterious. The painting depicts peasants moving through their time-honored routines of bringing in the hay. A small image hardly does justice to the glorious painting. Pieter Breugel was known in his lifetime by the nickname “The Peasant” because he often dressed in peasant clothing so that he could blend in and observe his subjects for long periods of time. The people in this painting have a natural nobility and a natural connection with the agricultural landscape that sustains them. Prague is not my favorite city. Years after the fall of the Iron Curtain, it is still pretty rough around the edges. I rented an apartment from an agency there. I asked how to get from the train station to the agency office. I was told to wait right on the train station platform for a driver to collect me. According to Rick Steves, hailing a cab outside the station invites severe overcharging or worse. I guess that must be true. Once I got settled, though, I felt perfectly safe in tourist areas. No doubt there are pickpockets, as in any large city, but I had no problems. 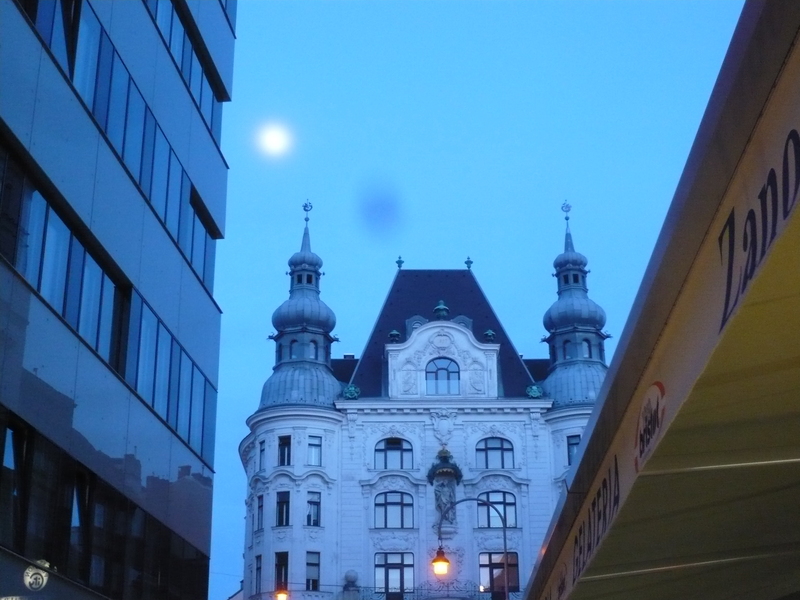 The city is a magnet for all of Eastern Europe, so it is full of partying crowds day and night. 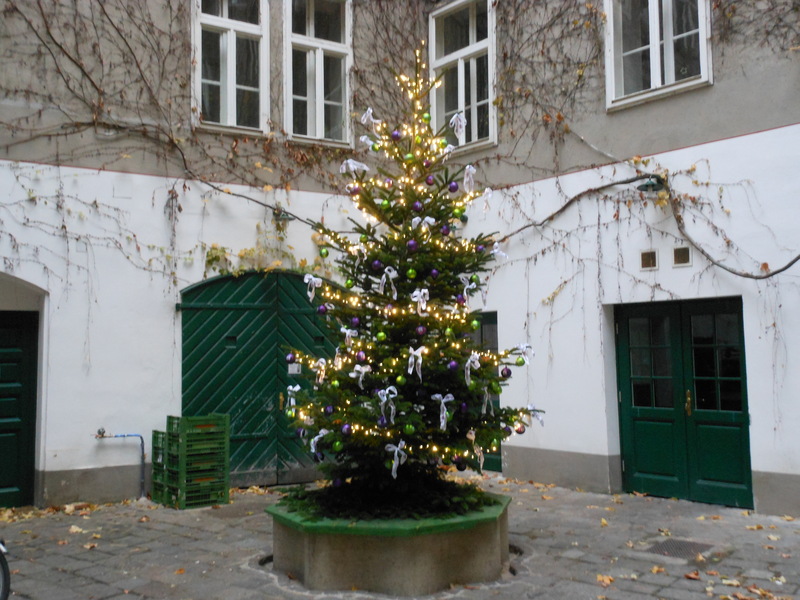 But the Lobkowicz Palace, on Castle Hill, is a haven of peace. The history of the palace is fascinating. The noble family lost everything to the Nazis, regained some of it, and lost it all over again to the Communists. They were staunch opponents of both regimes. The palace today hosts daily chamber concerts in a lovely, quiet music room. Afterward, a stroll through the grand rooms with an audioguide provides a unique glimpse into the turbulent history of the city, seen through the ups and downs of an aristocratic family. 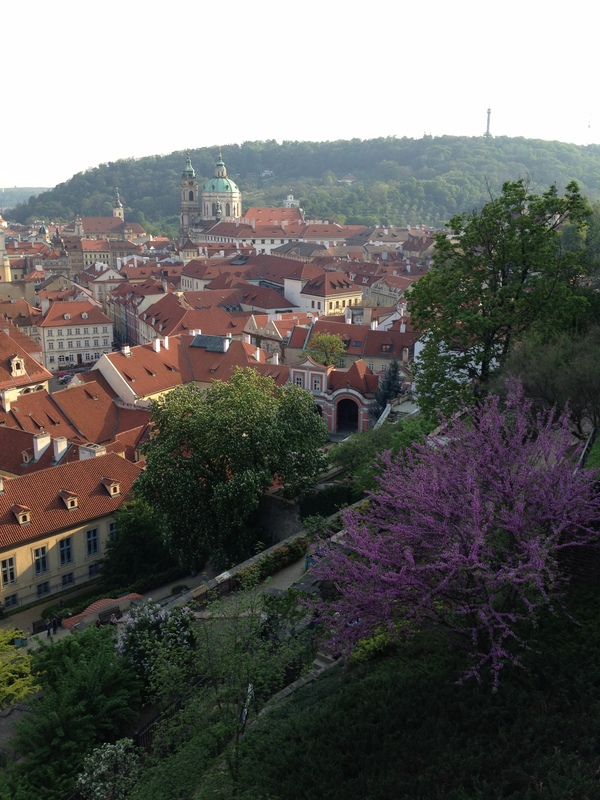 There’s a nice restaurant with views over the rooftops of Prague. This entry was posted in Czech Republic, Prague and tagged "Hunters in the Snow", Castle Hill, Czech Republic, Haymakers, Lobkowicz Palace, Pieter Breugel the Elder, Prague, taxis in Prague, The Haymakers, Vienna Kunsthistorisches Museum on January 21, 2014 by Claudia Suzan Carley.